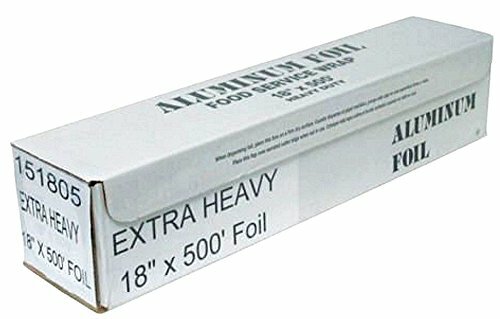 PREMIUM QUALITY 18"x500' EXTRA HEAVY DUTY FOOD SERVICE FOIL 0.0015 GAUGE (pack of 1) PRODUCT FEATURES: This EXTRA Heavy Duty Foil is 1.5x Thicker Than Our Top Selling Heavy Duty Foil 18" x 500 Feet (750 SQF) Premium Quality EXTRA Heavy Duty Foil Roll Our Competition Sells Reynolds Brand Equaivalent at Double the Price! Reinforced Corrugated Cutterbox, Not Flimsy Like Some of the Competition Each Roll is Brand New, Factory Sealed in Heavy Shrink Wrap This Is The Real Deal, EXTRA! ULTRA Heavy Duty 0.0015 Gauge Designed to Withstand the Toughest Kitchen Environments. Used by Many High-End Restaurants, Labs, and Scientific Research Facilities.